Would you like to share with your friends your achievement in Master Cleanse? 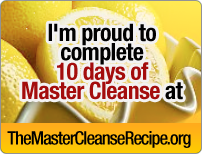 After 10 days of Master Cleanse, I’m sure you discover how the Master Cleanse has cleansed and detoxified your body. Now, you can share Master Cleanse with your family and friends. Choose any of the badges below and show off your Master Cleanse achievement in your blog or your website. Simply choose your favorite Master Cleanse badge, copy and paste the html code below each badge into your blog, website or even your Facebook page! If you would like to have your name on the personalized badges (look at the bottom badge samples), do email us at admin (at) themastercleanserecipe.org and we’ll put your name on the badges and send it back to you. If you have any suggestion or feedback regarding our Master Cleanse badges, do drop us a comment below! I made it! TEN TEN Let’s do it AGAIN. Only not right away. Actually, I am evaluating whether I will do another couple of days. I have been getting such great results the last day or two and I want to make certain I am truly finished cleaning out. My tongue is pink today, but there are signs I might have more work to do. I will read up a little more and make a decision tomorrow. I’m glad I had the experience. Despite the many people who were worried about what I was doing to myself, I am still alive. In fact, I feel more alive than I have in a while. I’ve seen some pretty incredible results after having followed the program exactly. I decided early on if I was going to do this, I would do exactly what was asked and not deviate–that way, when I was done, I would know for sure whether or not I thought it was helpful. The Master Cleanse gets my stamp of approval. It would be nice to have a few variables like number of days incase you do more that 10 and maybe the pounds lost incase you lose more than 10. I’m not new to fasting but this was the first Master Cleanse. It seemed to be less of an impact to the body even though it was a little more trouble considering the laxitive teas and salt water flushes but all in all I thought it was well worth while and plan on doing another after Jan.1, 2011. I completed 15 days and lost 17 pounds. This is my second day after the cleanse and I have started eating soup but still do the Lemonaide Drink for breakfast. I’m trying to keep my calories below my normal allowed in order to continue losing a little weight to compensate for the water weight gain. I have only gained back .8 oz to date.